The Kings haven’t historically been a team that has done things the easy way, but this year, they’re really beginning to push it. Following Monday’s 2-1 loss to the Calgary Flames, Los Angeles dropped to 4-8-5 on the road. No, that’s not a misprint. The defending Stanley Cup champs, with substantially the same roster that vaulted them past the New York Rangers to claim the Cup six months ago, have now lost thirteen of the seventeen games they’ve played away from the Staples Center so far this season. This isn’t the first time the Kings have demonstrated Jekyll & Hyde characteristics. Despite having proven firepower in the form of Drew Doughty, Anze Kopitar, Dustin Brown, Jeff Carter, Mike Richards, Justin Williams and Marian Gaborik for some or all of the past three years, the Kings generally found themselves near the bottom of the league in scoring. Just last year, Los Angeles finished 26th overall in goals per game (2.42). Note that the global offensive performance is relatively stable in both samples. There’s a slight decrease in goals per game on the road, but that’s hardly unique. In fact, it’s one of the smaller differences in the league. Corsi For % and Fenwick For % are both upper-tier, showing that the Kings are still a premier puck possession team. However, the road power play is largely ineffective, with just six goals in 17 games. 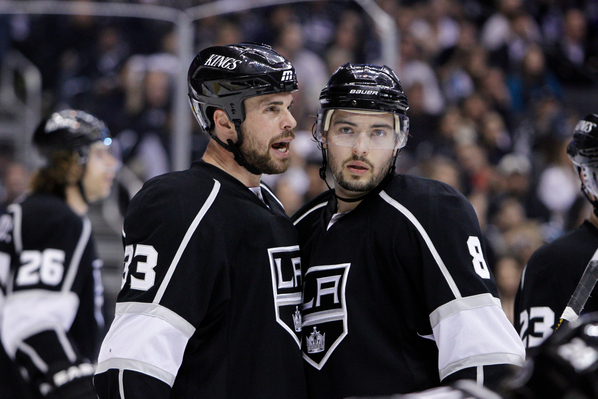 Could the loss of Willie Mitchell be a factor in the defensive inconsistencies in Los Angeles this year? As I argued just a few days ago, the Kings defense has taken a step backward this season. Measuring the defense based upon a formula using weighted averages in key categories, Los Angeles isn’t a top-five defense this year, and arguably not even top-ten. The home/road splits accentuate the point. L.A. gives up 1.2 more goals per game on the road than at home, the clear Achilles’ heel behind their poor record away from the Staples Center. Secondarily, as good as the power play has been on the road, it’s been weak on the road, with a -9 special teams scoring differential. In my previous piece, the readers generally concurred that the defense hasn’t been up to par so far this season. The loss of Slava Voynov, various injuries, the defection of Willie Mitchell and other factors were cited as causal factors. There may be more subtle issues that need addressing as well. Few make adjustments better than head coach Darryl Sutter and his coaching staff. It’s very likely they will make the necessary corrections to turn things around. In fact, if tonight is any indication — L.A. dominated in shots, possession, Corsi and scoring chances — they may already have. With road games at Edmonton (tomorrow night) and Vancouver (January 1), we’ll see whether or not Dr. Jekyll or Mr. Hyde shows up for the Kings. Here’s hoping it’s the mad scientist, not the monster.